Most of us don't give a second thought to shrubs—but to a moose, shrubs are a way of life. 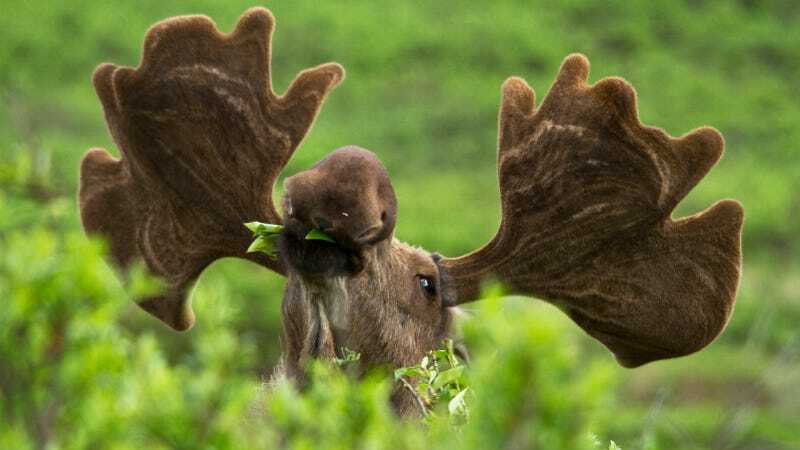 According to a new study, a warming climate has allowed moose to feast on shrubs in what was previously uninhabitable frozen tundra blanketing vast stretches of Alaska. The authors of the study, which was published in the journal PLOS ONE, estimate that since 1860 the average shrub height in the region they surveyed has increased from just over one meter to around two meters, "greatly increasing the available forage sticking up above the snow." While two meters may not seem that tall, in the windswept, frozen landscapes of the tundra that's about as good as it gets; and it's good enough to help the moose survive the long, harsh winters. Why have shrubs gotten to much taller in the last 150 years? As climate change has warmed the region, it's created longer and hotter growing seasons, making the flora hardier than under the previous conditions. This image shows changes in moose distribution (dashed lines) in northern Alaska since 1880. Shrub plots were distributed along the Chandler and Colville Rivers (orange ellipse), and temperature records were derived at two locations therein (gray dots). "Although scientists have been anticipating changes to wildlife in response to the observed changes in climate and vegetation of the Arctic, this is one of the first studies to demonstrate it," said Ken Tape, a lead author of the study and faculty member at the University of Alaska, in a statement. "We showed that the large-scale northward shift of moose was likely in response to their increasing shrub habitat in the tundra." According to Tape, moose will continue to carry this northern momentum forward as the Arctic keeps warming. Climactic changes will also allow the moose to get closer to the shore than before. "The sea ice lingers against the coast and so that has made the summer really short, so the height of shrubs goes down dramatically, but this is changing—they are getting taller near to the coast so you are getting more moose habitats nearer the sea," he told the BBC. While the study does not cover moose habitat in other northern countries, the authors believe a similar phenomenon is happening in places like Canada and Russia that are home to expansive tundra ecosystems. The study notes that this process of "boreal-isation" of the tundra—in which the tundra biome slowly shifts into a forest biome as the climate changes—is allowing other animals such as snowshoe hares to migrate to previously uninhabitable territory as well. They believe this signifies the emergence of an entirely new wildlife community in the region. These animals are not endemic to these ecosystems, so the long-term impact they have on existing flora and fauna remains to be seen. "These northward range shifts are a bellwether for other boreal species and their associated predators," state the authors.